Posted on: April 27th, 2015	by Melanie C.
The Teenage Mutant Ninja Turtles are bigger and better than ever in this blockbuster hit loaded with nonstop action and laughs! When New York City is in trouble, it’s up to these four ninja-fighting, pizza-loving brothers to save it. Aided by determined reporter April O’ Neil (Megan Fox) and their wise master Splinter, these unlikely heroes must face their ultimate nemesis – the evil Shredder. Now out on DVD and Blu-Ray, and coming this summer to the Regal Cinema Summer Movie Express! On a recent spring break rainy morning my five year old son, nine year old daughter, and I decided it was movie time. While my TMNT-obsessed son had seen the movie a few times without me, my daughter and I hadn’t, so we chose the new Teenage Mutant Ninja Turtles movie from the DVD kiosk. Not knowing what to expect, and not sure if it was too mature for him, I watched carefully. Teenage Mutant Ninja Turtles – what we liked! The turtles look different, but have the same personalities as the popular cartoon. They’re funny; they tease each other; they fight crime and they even beat box. There’s a message of teamwork and not leaving anyone behind in their crime fighting. They are outcasts in our world, and stick together to restore justice to New York City. The CGI and visual imagery in this film raised questions from my 9 year old about movie making – “are those real people in there?” “How do they DO that anyway?” It can open up a conversation about what’s real in movies, what to believe, the work that goes into film making and could even start a new hobby. This movie in particular raises those questions because it isn’t clear if the turtles are CGI or actors in costumes, and there’s a lot of detail to pay attention to. While the 9 year old asked questions about movie making, the 5 year old got out his ninja turtle masks, weapons and figures and was inspired by his favorite characters. I was happy to see both of them engaged, despite my impression that the story was silly. Still, it was bonding time, and we all enjoyed the movie in our own ways! There’s both ninja and gun violence in this movie. The attractiveness of April (Megan Fox) is a major theme through the movie and while she doesn’t dress provocatively, there’s some innuendo. Sensitive children could be bothered by a fire scene, and discussion about April’s father’s death. My 5 year old did okay, but I wasn’t crazy about the violence and his reactions to it, so I would suggest it for tweens and up. This movie is rated PG-13. 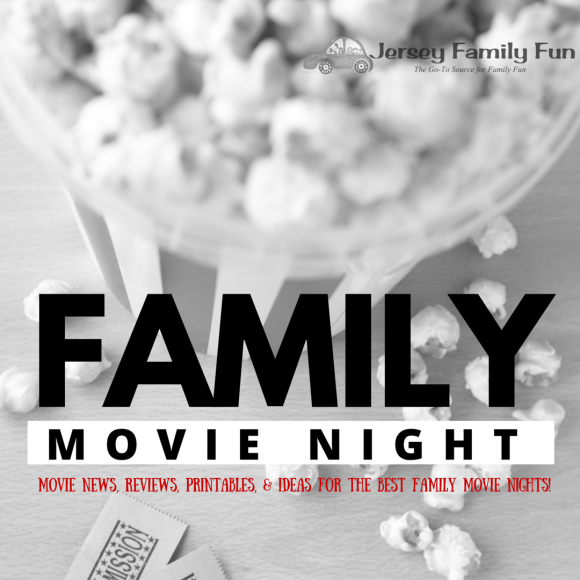 If you have an older Ninja Turtle fan in your house, make it a movie night with Raph, Leo, Donnie and Mikey! To help cover the costs associated with running a site like Jersey Family Fun, we participate in affiliate advertising programs. These programs pay us a small commission when readers purchase an item by using our links to it. You can help support the Jersey Family Fun site by purchasing The Teenage Mutant Ninja Turtles through one of the following links.